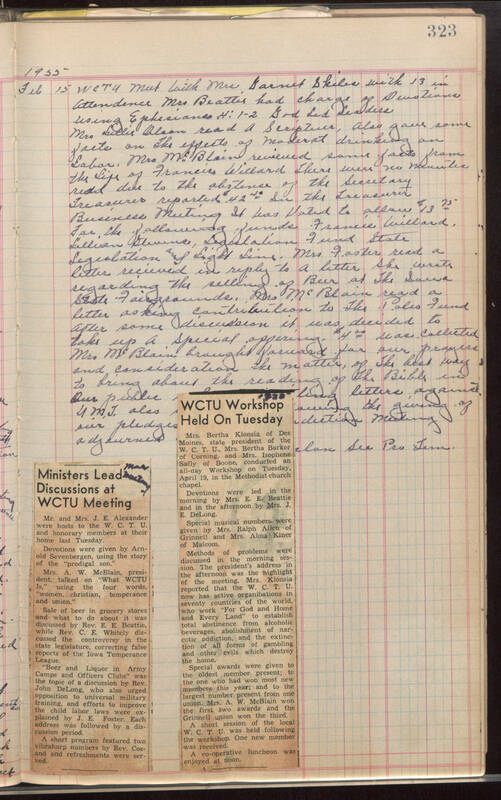 1955 Feb 15 WCTU meet [sic] with Mrs Garnet Skiles with 13 in Attendence [sic] Mrs Beattie had charge of the Devotions using Ephesians 4:1-2 God Led Leaders Mrs Lillie Olson read A Scriptuer [sic], also ave some facts on The effects of moderat [sic] drinking on Labor. Mrs McBlain reviewed some facts from the Life of Francis Willard There were no minutes read do to the abstense [sic] of the Secretary Treasurer reported $42.40 In the Treasurer [sic] Business Meeting It was voted to allow $13.75 For the following funds Francis Willard, Lillian Stevens, Legislation Fun State Legislation and Light Line. Mrs Foster read a letter recieved [sic] in reply to a letter She wrote regarding the selling of Beer at The Iowa State Fairgrounds. Mrs McBlain read a letter asking contributions to the Polio Fund After some discussion it was decided to take up a Special offering. $4.00 was collected. Mrs McBlain brought forward for our prayers and consideration the matter of The best way to bring about the reading of The Bible in Our public [unreadable] ...ing letters again U.M.T. [unreadable] ..owing the giving of our pledges [unreadable] ...diction Meeting adjourned [unreadable] ...clon Sec Pro Tem. (clipping) (handwritten on top) Mar meeting Ministers Lead Discussions at WCTU Meeting Mr. and Mrs. J. E. Alexander were hosts to the W. C. T. U. and honorary members at their home last Tuesday. Devotions were given by Arnold Sevenbergen, using the story of the "prodigal son." Mrs. A. W. McBlain, president, talked on "What WCTU Is," using the four words, "women, christian, temperance and union." Sale of beer in grocery stores and what to do about it was discussed by Rev. E. E. Beattie, while Rev. C. E. Whitely discussed the controversy in the state legislature, correcting false reports of the Iowa Temperance League. "Beer and Liquor in Army Camps and Officers Clubs" was the topic of a discussion by Rev. John DeLong, who also urged opposition to universal military training, and efforts to improve the child labor laws were explained by J. E. Foster. Each address was followed by a discussion period. A short proram featured two vibraharp numbers by Rev. Cosand and refreshments were served. (clipping) (handwritten at top [1955?] WCTU Workshop Held On Tuesday Mrs. Bertha Klonsia of Des Moines, state president of the W. C. T. U., Mrs. Bertha Baker of Corning, and Mrs Isophene Safly of Boone, conducted an all-day Workshop on Tuesday, April 19, in the Methodist chapel. Devotions were led in the morning by Mrs. E. E. Beattie and in the afternoon by Mrs. J. E. DeLong. Special musical numbers were given by Mrs. Ralph Allen of Grinnell and Mrs. Alma Kiner of Malcom. Methods of problems were discussed in the morning session. The president's address in the afternoon was the the highlight of the meeting. Mrs. Klonsia reported that the W. C. T. U. now has active organbations [sic] in seventy countries of the world, who work "For God and Home and Every Land" to establish total abstinence from alcoholic beverages, abolishment of narcotic addiction, and the extinction of all forms of gambling and other evils which destroy the home. Special awards were given to the oldest member present; to the one who had won most new members this year; and to the largest number present from one union. Mrs. A. W. McBlain won the first two awards and the Grinnell union won the third. A short session of the local W. C. T. U. was held following the workshop. One new member was received. A co-operative luncheon was enjoyed at noon.